Publisher: Bell & Daldy, London, 1870. An extremely rare edition of a scarce translation. 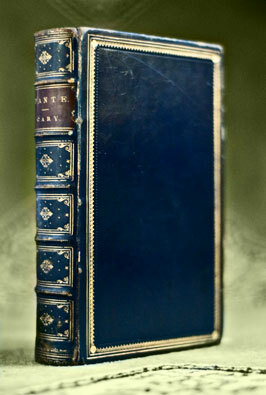 Condition: Full blue leather with gilt on edges, boards and spine. Very good overall, clean and unmarked text. Firmly bound. With the life of Dante, chronological view of his age, additional notes, and index. The Divine Comedy is an epic poem written by Dante Alighieri between 1308 and his death in 1321. It is widely considered the preëminent work of Italian literature, and is seen as one of the greatest works of world literature. The poem’s imaginative and allegorical vision of the afterlife is a culmination of the medieval world-view as it had developed in the Western Church. It is divided into three parts, the Inferno, Purgatorio, and Paradiso. On the surface the poem describes Dante’s travels through Hell, Purgatory, and Heaven; but at a deeper level it represents allegorically the soul’s journey towards God. 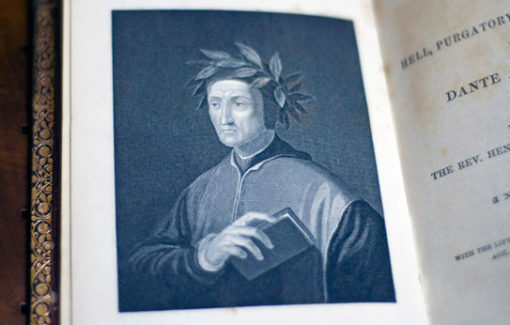 At this deeper level, Dante draws on medieval Christian theology and philosophy, especially the writings of Thomas Aquinas. The poem is written in the first person, and tells of Dante’s journey through the three realms of the dead, lasting from the night before Good Friday to the Wednesday after Easter in the spring of 1300. 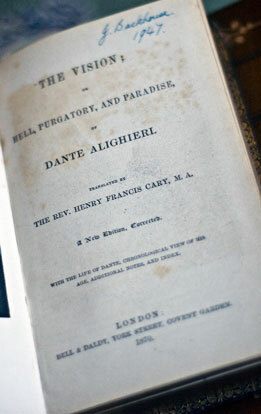 The Roman poet Virgil guides him through Hell and Purgatory; Beatrice, Dante’s ideal woman, guides him through Heaven.